Adam’s words were perhaps as much of a challenge as a personal dictum, and over the past 25 years a new generation of photographers has sought to create a direct and clear-eyed appraisal of the American landscape that incorporates the formal lessons of the New Topographics; the influence of cultural historians, geographers and environmental scientists; and visual reminders of the first photographers to document the West in the 1960s and 1870s. Their work is not without lyricism and affection that has characterized more traditional landscape photography, but they are more likely to draw attention to commonplace or overlooked places that stand between us and the mythic horizon. Rather than engaging in an argument about what defines wilderness, recent photographers have allowed for a more sophisticated dialogue addressing the history of the West and its transformation through multiple eras of settlement and industrialization. 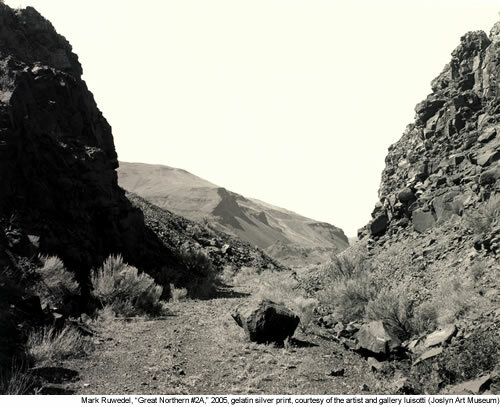 While not absent of critique or the acknowledgement of loss, these artists have attempted to create a language of acceptance and possibility, one that is meant to help affect and influence attitudes and choices surrounding the present and future of the West, as well as offering a rubric for understanding the landscape as it greets us today. Eschewing the dramatic peaks of Rocky Mountain National Park, William Wylie chose to focus instead on the Cache la Poudre River as it flows from its headwaters in the park to join the South Platte, just north of Denver. 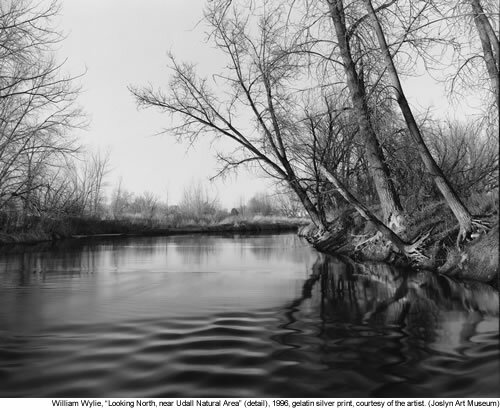 Wylie walked the length of the Poudre with his camera, photographing this “working river” as it passes through a landscape marked by recreation, agriculture and industry, its banks lined by cottonwoods in some places and railroad tracks or diversion dams in others. Every site, however, was described with the same elegance and respect, suggesting that all places—no matter how they might appear at first glance—are capable of offering subtle insights. Barbara Bosworth has adopted a unique method of creating panoramic images, exposing three sequential 8 x 10” negatives and printing them side by side on a single sheet of paper. Desiring to impart a physical sense of place, her photographs convey the impression of being surrounded by the landscape. Centering her work around the idea that we are not separate or removed from the natural world around us, whether relaxing in the family backyard or driving a logging road cutting its way through the mountains, she has explained that while her photographs are not fundamentally environmental pictures, she wants them to help describe where we are, what it looks like and how it feels. Mark Ruwedel has followed the routes of abandoned 19th-century rail lines to trace the first wave of industrial expansion into the West, and what was in many cases its subsequent failure. Each image represents either a rail “cut” or “grade,” an area where the landscape was altered to accommodate the course of the railroad, whether by blasting and excavating through mountains and canyons or in the often imperceptible grade of rail beds crossing open prairie or desert. They reveal that no part of the landscape is undisturbed, even if the clues are almost imperceptible, and that—when examined closely enough—the land itself can be read like a vast historical archive, from the evidence of prehistoric geological events to the scars of the atomic age. Rather than regarding the built environment in opposition to the natural landscape, Martin Stupich’s images describe the intertwined history of the natural and industrial worlds. 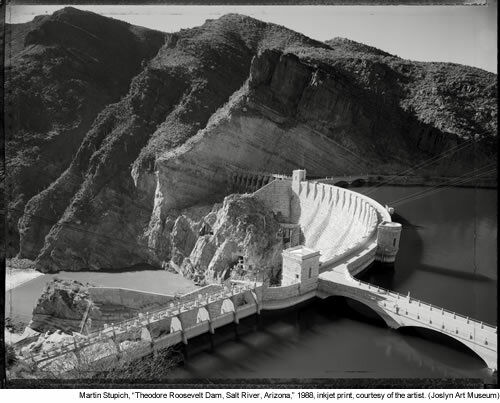 Over the past three decades Stupich has documented the convergence of 19th- and 20th-century engineering efforts—including mines, dams, factories and highways—with the landforms of the West. In his photographs, the concave sweep of a dam face is rendered with equal elegance as the profile of the mountain it faces or a bridge under construction arcs gracefully overhead, a subtle reminder that there is often less distance between the natural landscape and the world we have created than might be imagined. 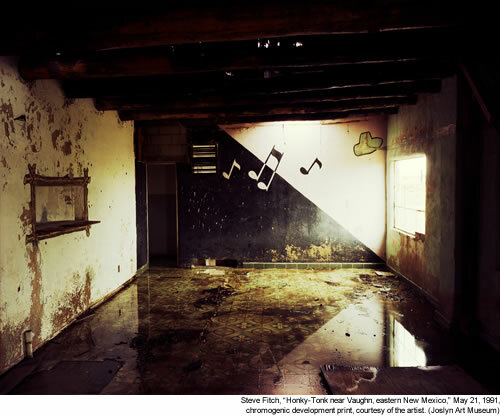 At first glance Steve Fitch may seem an unlikely member of this group, but his images of abandoned homes, schools, honky-tonks and churches across the High Plains portray what he has called “the most private part of the landscape.” A record of the human history of settlement of the West and its equally frequent failure due to climate or economics or simple bad luck, his photographs are an archaeology of the 20th century. Forced to move on from farms and towns that once held promise and ambition, families often left behind homes full of furniture, clothes and personal belongings that have created enigmatic tableaus reflecting the challenges of the western landscape. Each of these photographers’ images reflect an open and direct acknowledgment of our imprint on the land as well as the acceptance of our place within it. The vista discovered along the highway through the car window is understood to be just as important as the panorama from an overlook at a national park. Although their work is neither ironic nor overtly political, it recognizes the complexities of our relationship with the landscape and seeks to define a path that reconciles our lasting desires for an undisturbed view of the horizon with the realities of the modern West. 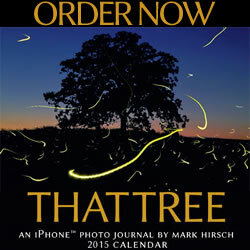 Together, these images speak with empathy and affection for the landscape, and hope for its future. “American Landscape: Contemporary Photographs of the West” will be on view at the Joslyn Art Museum from Sept. 17, 2011, through Jan. 8, 2012. The exhibition features over 80 photographs by 14 photographers. Sept. 22, Oct. 27, Jan. 5; 6:30 p.m.
View the exhibition with Toby Jurovics, Joslyn’s chief curator and Holland curator of American Western Art. Admission: Free for Joslyn Members; free with regular museum admission for the general public. Join Toby Jurovics, Joslyn chief curator and Holland curator of American Western Art, and Professor Alan Kolok, director of the Aquatic Toxicology Laboratory, University of Nebraska at Omaha, and interim director of the Center for Environmental Health and Toxicology, University of Nebraska Medical Center, in a discussion about the Elkhorn River watershed. Speakers will address the natural and cultural history of the river and ecological studies taking place at the Elkhorn River Research Station. Following the discussion, Dr. Kolok will lead a tour of the research station for interested participants (space is limited; registration online in September for a place on the optional tour). This event is sponsored by Joslyn Art Museum, University of Nebraska at Omaha – Service Learning Academy and the University of Nebraska Medical Center. Nov. 1, 8, 15; 7 p.m.
Film Streams, in partnership with Joslyn Art Museum, will present three films about the modern West on the first three Tuesdays in November. Each screening will be introduced by a curator, critic or artist. Admission: Regular Film Streams ticket prices. Visit www.filmstreams.org. Join Steve Fitch, Martin Stupich and William Wylie as they discuss their photographs in the exhibition American Landscape. Introduced and moderated by Toby Jurovics, Joslyn’s chief curator and Holland curator of American Western Art, the afternoon will conclude with a gallery walkthrough with the artists.